What CCTV System is Right for Me? If you're looking to install CCTV in your home or business, or perhaps you're looking to upgrade, you'll probably be aware that there are several different technologies available. How do you know which one is right for you? It's worth looking at the pros and cons of each technology so you have a starting point in selecting the righ system for your needs. Analog is the oldest form of CCTV monitoring. A lot of companies are moving away from analog these days to IP, which can produce higher quality video. However, it's not yet time to dismiss analog. Newer forms of analog, such as HDTVI and AHD, are able to produce very decent image. They can also often give better bang for your buck. Many old CCTV systems in commercial premises run on analog. The quality is usually very poor compared to even a cheap system you can buy today. Often it can be impractical to rewire a whole shop; you can use the existing analog wiring to install a HDTVI system which can produce significantly better image quality than on your old system. 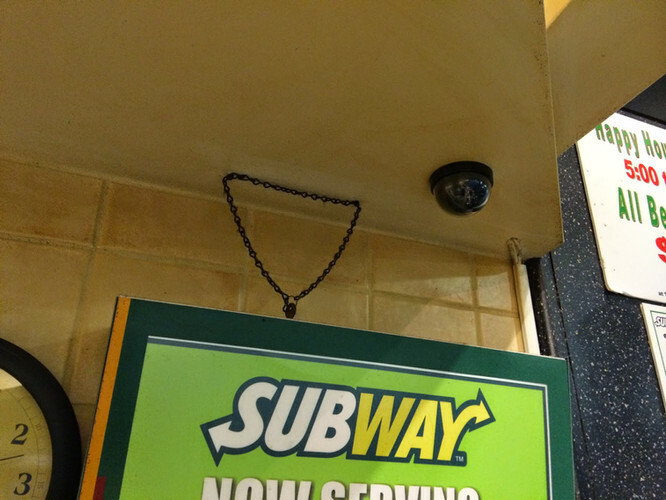 Old analog cameras like this one in a Subway store can be upgraded without changing the cables. I personally recommend the techview system from Jaycar. It has all of the above features as well a a user friendly interface and a great app for monitoring. IP is the new technology of the CCTV world. Using 4 pair ethernet cable to trasmit signals, the capabilities of an IP system, both in image quality and for other practical reasons, leaves analog in the dust. So there are many practical things an IP can do in a retail environment that an analog system simply can not. Even if you don't need many fancy features such as number plate recognition and POS integration, an IP system can still be the best option for you for simple monitioring of your home or business. If you put a 4MP camera on an IP sytem you'll actually get 4MP, unlike analog where a lot of that image resolution is lost because of the cables. IP pros: Better resolution video, more advanced features, better future proofing. IP cons: More expensive than analog, rewiring old cables can be a hassle. Wireless systems from companies like Swann are very popular on the DIY market, though sometimess professional installation can be the best way to go. Often, the term wireless can be misleading as the cameras still need power which involvess running, you guessed it; wires! Some systems do run on battery but even the best one's don't last more than 6 months. Also a lot of wireless systems have a small range of <20 metres. Outside that range the cameras simply won't work. With this information you're now ready to start making decisions on what CCTV system is right for you. For more information contact me (Ryan) or send a message on Facebook. You can shop for CCTV products on our online store or alternatively contact us for specials on supply and install packages.